Thomas Cravino was born in Mullion Creek in 1892 to gold prospector Thomas Cravino snr and his wife Elizabeth nee Smith. He was educated at the Wellington Public School and was later employed by Thomas Rowe of North Wellington. In October 1915 Thomas travelled to Holsworthy to enlist in the First World War. He was assigned to the 19th Battalion, 9th Reinforcement as a private. Private Cravino embarked for overseas service in January 1916. He served in Egypt for one month, until joining the British Expeditionary Force and proceeding to the Western Front in France. In late May Private Cravino was wounded in action, sustaining a gunshot to the lower back. He was transferred to the 1st Australian Auxiliary Hospital in Harefield, England, and later to the Convalescent Depot in Epsom. In October 1916 Thomas was taken on strength with the 5th Training Battalion. He rejoined his battalion in France in June 1917. Thomas was admitted to the 54th General Hospital in December 1917 with bursitis and bronchitis. Six weeks later he was again transferred to the 1st Australian Auxiliary Hospital in Harefield for treatment. After a period of furlough Thomas rejoined his unit in France in May 1918. Thomas Cravino was killed in action on 29 August 1918 during the Battle of Mont Saint-Quentin. He is commemorated on panel number 88 on the Roll of Honour at the Australian War Memorial in Canberra. 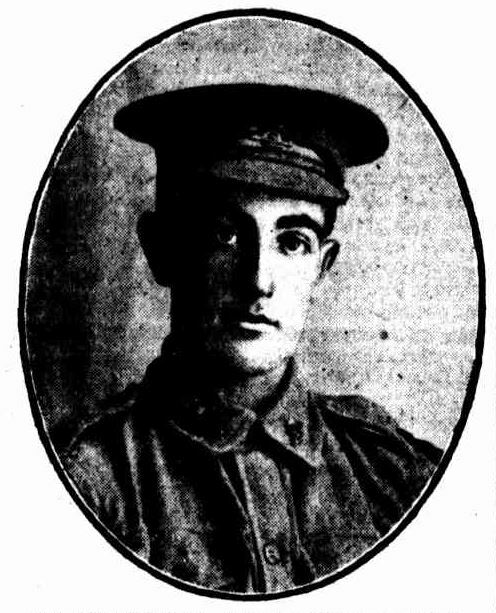 Thomas’ brother William also served in WWI; he returned to Australia in July 1918. Charles Joseph Roberts. Image courtesy Lithgow Mercury. I have much pleasure in forwarding hereunder copy of extract from 1st ANZAC Routine Orders, dated 24 April 1917, relating to the conspicuous services rendered by your son, No 1728, Lance-Corporal CJ Roberts, 53rd Battalion. The above has been promulgated in Military Order No 290 of 14 July 1917. I went out seven times one dark night right into the German barbed wire. It was pretty rough on the nerves — shot and shells and bombs falling and rattling around you all the time. I just thought of all at home, and I think that kept my head clear. Anyhow, I got valuable information for our battalion. For this I got the military medal and a special leave of ten days to go to England, Ireland, Scotland, or Cornwall. I am just waiting for the day when I go on my leave. Charles jnr was born in Lucknow in 1893. He was the first son of Anna Mine manager Claude Hubert (aka Charles) and Caroline Roberts. A second son, John Francis Roberts, followed in 1895. The boys were educated at Shadforth Public School; their mother Caroline died when Charles and John were aged just seven and five years of age. In about 1914 Charles and his boys moved to Portland, where Charles snr found work at the Boulder Mine. On 14 February 1916 Charles and John travelled to Bathurst to enlist in the First World War. At the time Charles was employed by local Portland storekeeper James Loneragan as a carter. Charles embarked HMAT A40 Ceramic in Sydney 14 April 1916, a private in the 53rd Battalion, 2nd Reinforcement. Private Roberts spent six weeks in Egypt and one month in England before proceeding to France. On 5 December 1916 Charles was promoted to Lance Corporal, and in April 1917 was recommended for the Military Medal. He undertook a weeks’ training at Muskety School prior to sustaining the wounds that would see him evacuated to England in May 1917. 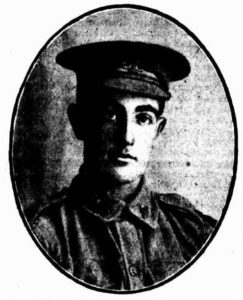 Lance Corporal Roberts was discharged from hospital on 13 July 1917. He served for a further two months before being invalided home. He arrived in Sydney on 19 November and was discharged from the AIF on Christmas Eve. Charles returned to Portland after his war service. In 1918 he married Mary Coleman. Charles worked for the Portland Co-op managing the grocery department. He played an active role in the local community; he was an office bearer with the Portland Friendly Society, and in 1925 was accepted as a Justice of the Peace. Mary passed away July 1931. Charles remained in Portland; his name appears on the on the town’s census for the final time in 1963. Charles Joseph Roberts is commemorated on the Shadforth Public School honour roll. 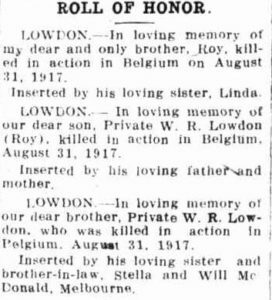 Charles’ brother John was killed in action in France in July 1918.